In the summer of 2008 my husband and I took a wonderful road trip up through the Northeast. Normally our travels mean we get on a plane and go explore some other part of the US or the world. And while the Northeast feels decidedly different than DC and the mid-Atlantic region, it is close enough that we were able to skip the flight and car rental formula in favor of packing up our car and hitting the open road. Having our own vehicle and not being beholden to any schedule or airline luggage restrictions meant we really did have the freedom to do what we pleased. For me this meant stopping in every secondhand bookstore we came across. After two weeks traveling through the Finger Lakes, Adirondacks, and Hudson River Valley in upstate New York, the beautiful Berkshires in western Massachusetts, rural Vermont, New Hampshire, and Connecticut, and a final stop in Bucks County, Pennsylvania we arrived back in DC with about 75 more books than when we left. During our overnight stay in Woodstock, Vermont we came across one of the nicest little bookshops on the whole trip. Pleasant Street Books is in a converted barn behind one of the houses that line the main street through town. It was a great place to spend a rainy afternoon. It had a really nice balance between antiquarian books and good secondhand reading copies and had a friendly, helpful proprietor behind the desk. While we were there I came across a stack of books by May Sarton. I knew the name, and had a vague notion that she was someone I should read, but I didn’t know anything about her. I am not sure why I was initially drawn to these old Norton paperbacks stacked on the floor in front of the shelves. When I started to look through them I noticed they had all been owned by the same person and was intrigued by the notion that whoever Susie was, she liked Sarton well enough to own eight of her books. The descriptions on the back of the books indicated that Sarton had been a bit of a local, having lived for many years in neighboring New Hampshire. It seemed fitting that our Northeast road trip should be commemorated with the purchase of some native literature. Back in June, Art Durkee over at Dragoncave posted a lovely entry about his pilgrimage to Nelson, New Hampshire to see Sarton’s grave. He has some very striking pictures of Sarton’s milieu that so nourished her over the years. Among the pile of Sarton were some of her novels and a few of her published journals. I started off by reading The Small Room a novel from 1961 about an academic and administrative crisis at a New England girls college. The second one I read was Kinds of Love, a novel about a long married couple, their friends and family and their relationships in a small New England town. I liked both books quite a bit, although I think The Small Room appealed to me more. It has been about a year since I read them, but I remember them having a kind of cozy but somewhat austere New England setting where nature and the seasons, and small town life are as important as any of characters in defining the books. Later I moved on to a few of her journals beginning with Journal of Solitude and The House by the Sea. I liked those two immensely but will talk about them in context of my most recent Sarton read. May Sarton was born in 1912 in Belgium but was raised in the United States where she died of breast cancer in 1995 at age 83. Based on her tombstone, Sarton considered herself, above all, a poet. Indeed she published sixteen volumes of poetry but she also published eleven works of autobiographical non-fiction and journals, nineteen novels, and two children’s books. It is unlike me to read things out of order, but so far I have been skipping around a bit among her autobiographical non-fiction. 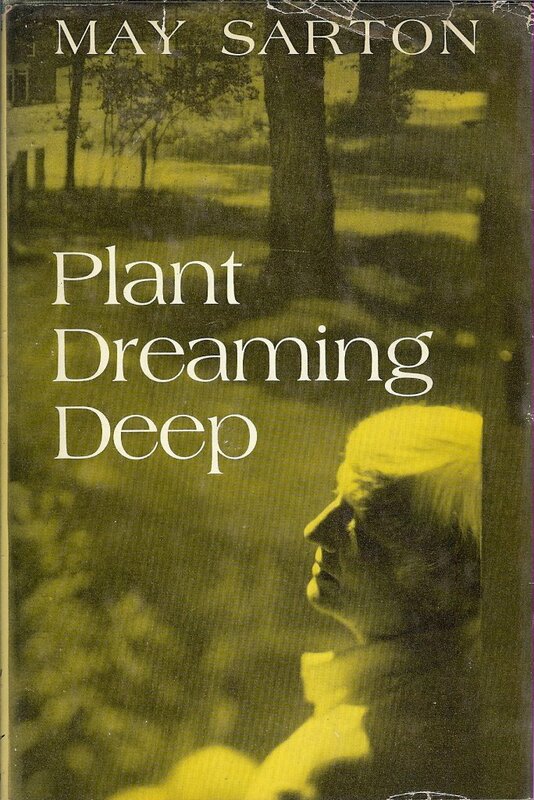 At first I could put it down to not owning all the necessary volumes to read them in order, but that doesn’t explain why I picked up Plant Dreaming Deep last week, instead of her first autobiographical volume. I can blame that on Wilkie Collins. After reading his fantastic novel The Woman in White, I needed something that was the exact opposite in style and content. Something based more firmly in real life. I needed to sweep up and clear away all of the Victorian drama and intrigue that was littering my psyche. I immediately thought of Sarton as the right tool for the job, and I skipped over her first volume of memoir because its detail was too much about dates and places and events. After so much plot, I wanted something that was pure description. Plant Dreaming Deep was the perfect solution. It describes Sarton’s first home purchase in 1958 at the age of 46, her process of turning the house and 36 acres into her sanctuary, and her daily life and the people who became her neighbors and friends. This is the volume that begins to tell the tale of Sarton’s life in Nelson, New Hampsire and it was wonderful. This is essentially a poet writing about domestic chores and the joy and pain involved in her daily life. Like two other of her journals that I have read, Journal of Solitude and The House by the Sea, Plant Dreaming Deep is a throwback to a time when the hum of an electric typewriter was considered noisy. She had books, and wood fires, and her garden, and a mailbox full of letters and cards, and friends who came to visit her, and all kinds of other things that makes me want to live in the past. But she also had to deal with drought, black flies, and woodchucks. And among the peace and quiet, as we learn in later journal volumes, she also suffered from debilitating bouts of depression. With black and white photos sprinkled here and there, Sarton’s journals are perfect for people who love writing, reading, and gardening, or anyone who fantasizes about living a quiet life in a beautiful setting. Where would you like to transplant yourself, and what do you want to do when you get there? I remember going to Asheville to visit a friend and we spent all the week going to sundry book shops. I came home with a load of books and it was there that I picked up and consumed Simone de Beauvoir's Memoirs of a Dutiful Daughter. Hoorah for bookish vacations! I love May Sarton, especially her journals. I find I prefer the journals to her fiction, but I should reread a couple to see if that still holds. Sounds like you had a very nice trip – the bookstore sounds like an especially serendipitous find. I opened Plant Dreaming Deep yesterday to read a few pages. And yes, it was just as soothing to my spirit as Journal of a Solitude was last month, my first May Sarton book. It's not that Sarton's books are cheery and everything coming up roses happy. Rather, her words hold truth and beauty. They serve up Sarton's everyday slice of reality. And my first serving of Sarton's words made me hunger for more. And — with a love of gardening and words — a name like Plant Dreaming Deeps was too hard to resist. So I didn't. I enjoyed your post very much. I have Nan (from Letters from a Hill Farm) to thank, for sending me to you. Her words remind me of Sarton. Amanda: I try and find a way to make every vacation a bookish vacation. Nan: Today would be a perfect day to go to that little bookstore. A rainy Sunday. Melanie: I think I prefer the Journals more than the fiction as well. Bestamesta: Thank you for the kind words. I think you and I like Sarton for similar reasons.